This 11-member advisory council, appointed by the Division Administrator, advises the Department on issues and rules relating to the safeguarding of persons and property from hazards arising from the installation and use of electricity. The rules are currently contained in chapter Comm 16. Next meeting: Thursday, October 6, 2011, from 9:30 a.m. to 2:30 p.m. in room 3B, Thompson Commerce Building, 201 W. Washington Ave., Madison, Wisconsin. For more information, contact Joe Hertel, joe.hertel@wi.gov. 608-266-5649. Follow council activity by joining the electrical program email group. See Code Development and Change Projects. This 8-member advisory council, appointed by the Division Administrator, has been convened on a temporary basis to review the 2009 changes within the “Existing Buildings” portion of the Wisconsin Commercial Building Code. This is part of an overall code development project that is updating Wisconsin Commercial Building Code to reflect 2009 model International Code Council codes. Next meeting: No meeting scheduled. Follow council activity by joining the commercial buildings program email group. This 7-member advisory council, appointed by the Division Administrator, advises the Department on issues and rules relating to the design, construction, operation, repair, inspection, assembly, disassembly and use of amusement rides at carnivals, fairs and other places of amusement for the safety of frequenters. The rules are currently contained in chapter Comm 34. Next meeting: No meeting scheduled. For more information contact Jim Quast, 608/266-9292, or TTY 608/264-8777, jim.quast@wisconsin.gov. Follow council activity by joining the Amusement Rides program email group. This 5-member statutory council, appointed by the Secretary of Commerce, advises the Department on issues and rules relating to licensing of automatic fire sprinkler contractors and journeymen automatic fire sprinkler fitters. The rules are currently contained in Comm 5. Next meeting: No meeting scheduled. For more information contact Jim Quast, jim.quast@wi.gov, 608-266-9292. Follow council activity by joining the automatic fire sprinkler program email group. This 10-member advisory council, appointed by the Division Administrator, advises the Department on issues and rules relating to the design, construction, installation, operation, inspection, testing, maintenance, alteration and repair of boilers and pressure vessels installed in public buildings and places of employment. The rules are currently contained in chapter Comm 41. Next meeting: Wednesday, September 14, 2011, in Room 3B of the Thompson Commerce Center, 201 West Washigton Ave, Madison, Wisconsin. Contact Joe Hertel, Safety and Buildings Division, 608-266-5659, joe.hertel@wisconsin.gov. Follow council activity by joining the boiler program email group. This 6-member advisory council, appointed by the division administrator, advises the department on issues and rules relating to the fire inspection and prevention programs, including Fire Department Dues. The rules are currently contained in chapter Comm 14. In 2009 there is a current code project that this council or group is working on. The code project intends to evaluate and update Comm 14, Fire Prevention Code, and Comm 60-66, Commercial Building Code, to keep the codes consistent in themselves and to national standards, and to respond to legislative directives. The current codes are based in part on adopted 2006 versions of International Code Councils Codes and National Fire Prevention Association 1, Uniform Fire Code. Adoption the 2009 versions of these model codes will be considered. Next meeting: No meeting scheduled. For more information, contact Sam Rockweiler, 608-266-0797, sam.rockweiler@wi.gov. Follow council activity by joining the fire prevention program email group. This 13-member council, appointed by the Division Administrator, advises the Department on statewide minimum rules for construction, operation, and maintenance of public buildings and places of employment. These rules are currently contained in chapters Comm 61 to 65. Next meeting: No meeting scheduled. For more information, contact Lori Curley, lori.curley@wi.gov, 608-261-8504. This subset of the Commercial Buildings Code Council and the Multifamily Dwelling Code Council will review some portions of the International Building Code as part of an overall code development project working toward updating the Wisconsin Commercial Building Code to reflect 2009 model ICC codes. This 16-member council, appointed by the Division Administrator, advises the Department on issues and rules relating to fire protection systems for public buildings and places of employment. These rules are currently contained in chapter Comm 62. This 11-member council, appointed by the Division Administrator, advises the Department on issues and rules relating to fire safety provisions for public buildings and places of employment. These rules are currently contained in chapter Comm 62. In 2009, this council is working on a code project that is evaluating and updating Comm 14, Fire Prevention Code, and Comm 60-66, Commercial Building Code, to keep the codes consistent in themselves and to national standards, and to respond to legislative directives. The current codes are based in part on adopted 2006 versions of International Code Councils Codes and National Fire Prevention Association 1, Uniform Fire Code. Adoption of the 2009 versions of these model codes will be considered. This 3-member statutory council, appointed by the Secretary of the Wisconsin Department of Commerce, advises the department on issues and rules relating to certifying the financial responsibility of contractors who obtain building permits to perform work on one- and 2-family dwellings, continuing education courses and exams for dwelling contractors, and certification of Uniform Dwelling Code inspectors. Related rules are currently contained in chapter Comm 5. Follow council activity by joining the dwelling contractor and UDC program email groups. This 10-member statutory council, appointed by the Governor, advises the Department on issues and rules relating to elevators and other conveyance systems such as dumbwaiters and escalators. The rules are in Comm 18, Elevators, Escalators, and Lift Devices Code. Next meeting: Wednesday, November 2, 2011, from 9:30 a.m. to 2:30 p.m. in the Kennedy Administration Building, Town of Westport, 5397 Mary Lake Road, Waunakee, WI. Click here for map and driving directions. For more information, contact Joe Hertel, joe.hertel@wi.gov, 608-266-5649. Follow council activity by joining the conveyance safety / elevators program email group. I thought I might add more comments regarding the Whitefish Bay job I was on Friday. Pictured above is the burned up pull out. One picture is the front side, the other picture is the back side, slightly out of focus. As I had mentioned yesterday, the other electrical contractor and electrician that came out last month had removed the pull out. When the electrician tried to pull out the burning up pull out, he was not able to. The pull out metal pieces and plastic had melted and fused not allowing the pull out portion to be removed. The electrician removed the wires and then removed the pull out block with the pull out fused in the block. Each step the electrician performed was very good. What I would like to write about is preventive maintenance a homeowner can perform. It is simple; I do it on every job. I call it the sniff test. Our master electricians in Sparks Electric in the city of Milwaukee work all over in the city and the suburbs performing many diagnostics and troubleshooting many electrical problems. Usually one of the first things I do before going into an electrical box or fuse panel or circuit breaker panel is perform a sniff test. (For the 87% of the population that do not smoke, this is an easy test with an undeniable burnt carbon odor. If you are amound the 13% that smoke, you may not be able to smell it.) If anything is badly burning up, you will know right away and be alerted to be more careful when opening up any box because sometime the energized wires snap out at you in such a situation. Old fused electrical services are three times more like to start a house fire and they usually start burning up slowly, often flickering the lights or connected loads such as the appliance or electronics. In the process of the flickering, surges are often created that can damage the electronics. 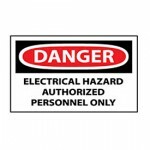 These are all signs that an electrician needs to be called in for diagnostic or to troubleshoot your electrical system. Ignoring the flickering can lead to severe problems and fires like this panel had. A second test can also be performed whether or not you smell anything. That is the touch test. I usually always touch the panels, fuses, switches, and receptacles to sense any excess heat building up. Where there is excess heat in a particular area or component, that’s a good signal that something is breaking down, usually the integrity of the components. There is a third test that can be done and that would be with the use of an IR detector. I love Fluke test equipment. Some will give you a temperature reading, some of the more expensive and larger IR testers other will give you a graphical display, or thermograph or thermal image with the various temperatures indicated by color. These are used in many industrial applications. Fluke also makes the finest and most accurate electrical testers in the industry. I have been using Fluke for 40 years. It started with my military training and troubleshooting as a missile electronics instrumentation mechanic working in electronics and on the SR-71. I’ve been sold on Fluke ever since. The military is also where I or should I say they developed my systematic troubleshoot techniques and the attitude to do anything electrical with 100% perfection. I will not compromise on electrical safety or my integrity. I often see this in old equipment when corrosion is present or just beginning to develop and in handyman work. A handyman seldom tightens the connections properly. 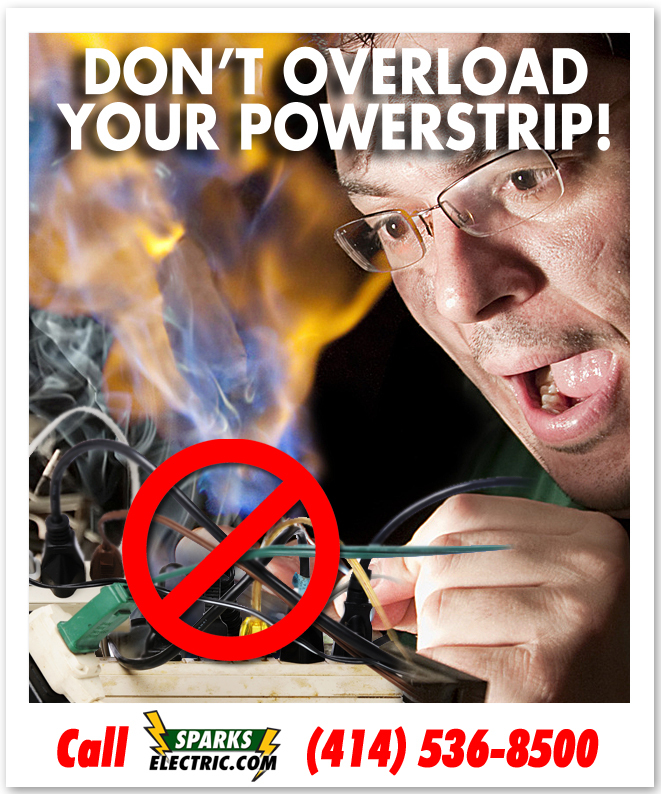 Loose connections often lead to overheating or intermittent power outages. Handymen creates lots of work for electrical contractors and electricians. The loose connections can expand and contract as the current passes through the wiring and the components. Any loose connections become excessively hot, the heat causes excessive corrosion, arcing and sparking often starts to develop and the power often starts to flicker during the sparking and arcing. By now, you may be able to smell the carbon burn odor. As a renter, homeowner, maintenance person, professional, or business person, power should be turned off or disconnected before it gets any worse. The last thing anyone wants is a fire, property loss, or life loss. 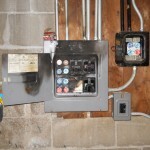 So when you are experiencing electrical issues, do not ignore it but investigate it. Call a licensed electrical contractor who employs trained and experienced electricians. A handyman is neither licensed nor qualified to work on your wiring system. When in doubt, remember safety comes first. I was on an interesting free estimate today in Whitefish Bay, Wisconsin, part of the North Shore of Milwaukee and Lake Michigan area. While there, I ended up providing some free electrical service as a bonus. 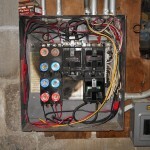 Here are two of several photos I took of the main fuse panel and wiring. As far as the old 60 amp fuse panel goes, it was originally a very nice fuse panel. Now with the old fuse panel being about 70 +/- years old, it is tired and worn out. It is on its last leg and as you can see, it could have burned the house down. Do you have old fuses in your home? I forgot to ask the tenant while I was there if they have working smoke detectors, I usually do that and even carry spare batteries just in case they are needed. While I’m on the subject, do you have smoke detectors, a carbon monoxide detector, and are the batteries still good? OK, back to the Whitefish Bay job. Smoke detectors, and now carbon monoxide detectors are needed and also required by law. They are especially needed with an old house with bad wiring and a burned up fuse panel. The old fused services are three times more likely to be part of a house fire. Fortunately, a sharp 14 year old son saw the first signs of a problem with the electrical system in the house. He got his dad and they investigated the old fuse panel in the basement. As they were walking down the stairs to the basement, they started seeing smoke everywhere. That is a scary feeling, ask anyone who has experienced such an event. Everyone knows, where there is smoke, there is fire. They called an emergency electrician out to the home and he disconnected and removed the burning fused pull out. Unfortunately, it wasn’t Sparks that was originally called. This originally happened a month ago. The tenant that is occupying the home has been waiting for the Chicago owner to do something about it. Some of his power has been out in the house, including his gas furnace, most of the basement, and some of the first floor wiring was also out. Why the Chicago owner has not corrected this problem yet is any ones guess but I would like to think he just does not realize how bad and how dangerous the wiring problems are. As I looked at the fuses, I replace two of his 15 amp fuse-stats, the two blue centered fuses on the right side toward the center of the panel. 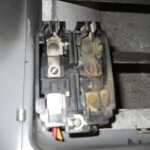 It is probable that the heat from the burning pullout overheated the fuses to the left allowing them to burn out. The other contractor gave a proposal 150% higher than what Sparks quoted and missed the blown fuses that were in plain sight. I did not need a tester to check the fuses, I could see they were bad. The tenant got his furnace restored, the basement lighting restored, and some of the wiring on the first floor restored, all for free because I was on a free estimate. Sparks Electric.com provides excellent top quality service at very reasonable prices, often far cheaper than the completion. All of this is provided without sacrificing on quality or safety, where we do not, where we will not compromise while providing the most outstanding service in the Milwaukee area. I did not do any troubleshooting but they had some other needs that needed to be taken care. This is part of what the proposal was for. I called the Chicago owner regarding his property and faxed the proposal to him. I also sent an email with the photos I’ve taken. Hopefully he will see just how bad the wiring is and understand that it is critical for life safety and building safety to have a quality electrical contractor (like Sparks Electric) proceed with the needed repairs, replacement, and an upgrade before anything else bad happens. Surge protectors do not quite operate instantaneously; a very slight delay exists. The longer the response time, the longer the connected equipment will be exposed to the surge. However, surges don’t happen instantly either. Surges usually take around a few microseconds to reach their peak voltage, and a surge protector with a nanosecond response time would kick in fast enough to suppress the most damaging portion of the spike saving our electronics, appliances, motors, and light bulbs. What is a nano second? From Wikipedia: A nanosecond (ns) is one billionth of a second (10−9 s). One nanosecond is to one second as one second is to 31.7 years. Therefore, response time under standard testing is not a useful measure of a surge protector’s ability when comparing MOV devices. All MOVs have response times measured in nanoseconds, while test waveforms usually used to design and calibrate surge protectors are all based on modeled waveforms of surges measured in microseconds. As a result, MOV-based protectors have no trouble producing impressive response-time specs. OK, what is a micro second? From Wikipedia: A microsecond is an SI unit of time equal to one millionth (10−6) of a second. Its symbol is µs. A microsecond is equal to 1000 nanoseconds or 1/1000 millisecond. Because the next SI unit is 1000 times larger, measurements of 10−5 and 10−4 seconds are typically expressed as tens or hundreds of microseconds. 1 microsecond (1 μs) – cycle time for frequency 1 x 106 hertz (1 MHz), the inverse unit. This corresponds to radio wavelength 300 m (AM mediumwave band), as can be calculated by multiplying 1 µs by the speed of light (approximately 3×108 m/s) to determine the distance travelled. 1 microsecond – the length of time of a high-speed, commercial strobe light flash. Slower-responding technologies (notably, GDTs) may have difficulty protecting against fast spikes. Therefore, good designs incorporating slower but otherwise useful technologies usually combine them with faster-acting components, to provide more comprehensive protection. How does a Lightning Surge Arrestor Work? A surge arrestor possesses two high voltage terminals, a neutral terminal, and another terminal wired to the ground. When targeted, the lightning surge, or perhaps a switching surge moves towards your precious appliances, traveling down to the arrestor through the power system, the harmful current is diverted around the protective insulation, usually into the earth ground. This is why the ground is so critically vital to safety for both humans, electronics, or any connected load. If you are not sure your ground is perfect, call your master electrician to check and repair or improve it if necessary. The concept of lightning surge arrestors is extremely broad with many categories and sub categories to it. Each day, as the sheer number of gadgets increases, so does the requirement for surge arrestors. Anything, and absolutely anything from personal computers to the toaster in the kitchen is susceptible to these surges and spikes and their destructive effects. 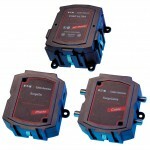 During the arrestor application, the main objective of the consumer is to set up the lowest rated surge arrestor. This will be rated such that it should have the most satisfactory service life when it is connected to your power system as it should provide the most protection it can to your gadgets. Preferably, it should be an arrestor of minimum rating as it will then provide the highest protection to your devices. Between the service life and the protection capability of a surge protector there is an extremely thin line. Higher arrestor ratings increases capacity of the surge protector to live and survive on a particular system while the less the ratings are, the higher the protection will be. When you are going to be buying a surge protector, you need to keep both the longevity of the equipment you are buying and the protection it will provide you in mind. Don’t buy cheap, you get what you pay for. The nearer the surge protector is placed to the equipment in need of protection, the better. Preferably, it should be placed at the terminals where the service is connecting to the equipment loads. We install our surge protectors in the main breaker as close to the main circuit breaker as practical. We also install each surge arrestor on its own two pole circuit breaker. If and when the breaker trips, the surge is over, the two pole breaker will than physically have to be reset or turned back to the on position. The LEDs on the front of the lightning surge arrestor / protector will be lit when the arrestor is energized. If the LEDs are off on the arrestor, it protected you from a major surge and turned itself off in the process. Buy the right equipment for yourself. Stay safe, save your electronics, save your motors, and save your money my having a quality lightning surge arrestor in your home and on your building. The End. 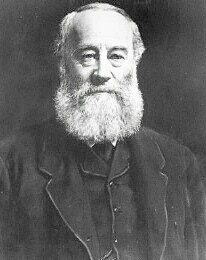 Joules rating: The term “joule” was originally named after physicist James Prescott Joule. There are several technical definitions and formulas associated with calculating joules, in terms of electricity it’s the amount of energy required to produce one watt for one second. The joules number defines how much energy the surge protector can theoretically absorb in a single event, without failure. Counter-intuitively, a lower number may indicate longer life expectancy if the device can divert more energy elsewhere and thus will need to absorb less energy. In other words, a protective device offering a lower clamping voltage while diverting the same surge current will cause more of the surge energy to be dissipated elsewhere in the system. An excellent ground is required for this to work properly, have quality oriented master electrician check this out for you. Better protectors exceed peak ratings of 1000 joules and 40,000 amperes. It is often claimed that a lower joule rating is undersized protection, since the total energy in harmful spikes can be significantly larger than this. However, if properly installed, for every joule absorbed by a protector, another 4 to 30 joules may be dissipated harmlessly into ground. A MOV (Metal Oxide Varistor) based protector with a higher let-through voltage can receive a higher joule rating, even though it lets more surge energy through to the device to be protected. Joule ratings are commonly-quoted but are very misleading parameters for comparing surge protectors. The quality of a surge protector relies heavily upon both the clamping voltage and the joule rating. Any surge of any arbitrary ampere and voltage combination can occur, but surges commonly last only for microseconds to nanoseconds, and experimentally modeled surge energy has been far under 100 joules. Expertly-designed surge protectors should not rely on MOVs to only absorb surge energy, but use them instead to survive the process of harmlessly redirecting the surges to ground. An overwhelmingly overloaded MOV should fail gracefully like a fuse, while diverting most of the surge energy to ground thus sacrificing itself, if needed, to protect equipment plugged into the surge protector. As an additional consideration, since energy in a MOV is stored as potential energy and is released as kinetic energy, a lower joule rating reduces fire and explosion hazards as long as a good to excellent ground exists. Some manufacturers commonly design higher joule rated surge protectors by connecting multiple MOVs in parallel. Since individual MOVs have slightly different non-linear responses when exposed to the same overvoltage, any given MOV might be more sensitive than others. This can cause one MOV in a group to conduct more (a phenomenon called current-hogging), leading to overuse and eventually premature failure of that component. If a single inline fuse is placed in series with the MOVs as a power-off safety feature, it will open and fail the surge protector even if remaining MOVs are intact. Thus, the effective surge energy absorption capacity of the entire system is dependent on the MOV with the lowest clamping voltage, and the additional MOVs do not provide any further benefit. This limitation can be surmounted by using carefully engineered matched sets of MOVs, but this matching must be carefully coordinated with the original manufacturer of the MOV components. Do You Know What A Lightning Surge Arrestor Is? Metal oxide varistors (MOVs) have been used for power system protection since the mid 1970s. The traditional lightning arrester commonly referred to or also known as surge arrester, had a high voltage terminal and a ground terminal. When a surge: lightning surge or switching surge, travels out or down the power system to the arrester, the current from the surge is diverted around the protected insulation in most cases to earth. 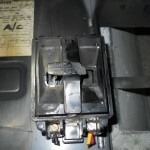 The arrestor senses the over voltage and instead of allowing it to travel through the supply system and damaging electrical loads such as appliances and electronics, it I shorted to the ground. This is why your power often goes out for a second when there is a close by lighting surge. You are actually seeing in real time either your lighting surge arrestor actually working or you are seeing the power company primary lighting surge arrestor operating and protecting your electrical equipment. So do not think of your blinking lights are a bad thing, it is actually a very good thing. Do You Know What A Surge Protector Is? This article primarily discusses specifications and components relevant to the type of protector that diverts (shorts) a voltage spike to ground; however, there is some coverage of other methods. The preferred terminology today is Surge Protection Device (SPD). The obsolescent term from the previous two decades is Transient Voltage Surge Suppressor (TVSS). Both of these terms are used to describe electrical devices typically installed in power distribution panels, process control systems, communications systems, and other heavy-duty industrial systems, commercial systems, residential systems, industrial, institutional, and military. Their designed purpose is to protect against electrical surges and spikes, including those caused by lightning and utility company customers. There are numerous scaled-down versions of these devices. They are installed in every imaginable application from agricultural, residential, commercial, industrial, institutional, military applications, to space industry applications. Most of the time, surge protectors are installed at the service entrance electrical panels, to protect equipment down line and protect against voltage surges that would otherwise create electrical damage if not an electrical hazard. Many power strips have basic surge protection built in; these are typically clearly labeled as such. However, persons who do not understand their purpose and function sometimes erroneously refer to power strips that do not provide surge protection as “surge protectors”. In an age when electrical appliances dominate the house, be it the kitchen, the bathroom or the many technical appliances used to give the drawing room a better look, a primary concern is the concept of surge protection. This is especially true when you connect a device to anything from a low to a high voltage electrical system. As the gadgets are most vulnerable to surges and spikes, the requirement of protection measures becomes necessary. One of the measures that you need to take to assure the safety of your gadgets is installing a lightning surge arrestor. Sometimes a lightning surge arrestor goes by the name of surge arrestors and these work on the insulation of your electrical power systems. Since the 1970s, metal oxide varistors (MOV) have been used in measures for power system protection; MOV’s are the backbone of most lightning surge arrestors.